Mr. and Mrs Hopwood, of 43 South Shore Street, Haslingden, have recently received official intimation that their son, Private John T. Hopwood of the Notts, and Derby Regiment, reported missing on the 11th of April, 1918, is now presumed to have died on that date. Deceased soldier who was 28 years of age was formerly employed as a raiser at Flash Mill, Grane Road, and enlisted in the Lancashire Fusiliers in 1916. Later he was transferred to the Notts and Derby Regiment and was wounded in October, 1917, as a result of which he was sent to hospital in Reedyford and subsequently to Heaton Park. In March of the following year he was sent overseas again and after an engagement he was reported missing. Another brother has also been serving with the forces. In loving memory of our dear son and brother, Pte. 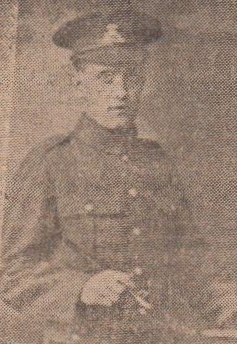 John (Jack) Hopwood, 2nd Batt, Notts and Derby Regt., who was reported missing 11th of April, 1918, now presumed dead, age 28. Now I will watch for you. I will come and lead you through. In the hearts he has left at home." From his sorrowing Father, Mother, Sisters, Brother Bob and Sister in law, Minnie, Blackpool. We'll some day meet again." From his loving sister and brother in law, Lizzie and Jim, 279, Helmshore Road. But trys to be brave and content." From his sorrowing sister Agnes and brother in law John. Our brother we loved so well." From his loving Sister and Brother in law (Lizzie and Jim), 279 Helmshore Road. And the sound of a voice that is still." From Father, Mother and Sisters, 43 South Shore Street.